The role that the peritumoral stroma plays in the growth of tumours is currently poorly understood. In this manuscript the morphometric characteristics of basal cell carcinoma subtypes and their associated peritumoral stromas are presented. Ninety eight digitized basal cell carcinoma histology slides were categorized as infiltrative, nodular, or superficial subtypes, and were analysed using a combination of manual and computer-assisted approaches. The morphometric characteristics of the tumour nests and their associated peritumoral stroma were quantified, and the presence of a marked immune reaction or elastosis was noted. The tumour to stroma ratio was different among each tumour subtype. Elastosis was identified in a greater proportion of the infiltrative tumours. Quantitative differences exist between the peritumoral stroma of basal cell carcinoma subtypes. Future work exploring the relation between these morphometric differences and biochemical variations in peritumoral stroma may further our understanding of the biology of carcinoma development. Carcinomas (cancers derived from epithelial cells) are accompanied by a specialized peritumoral stroma which plays an important but poorly understood role in the growth and metastasis of the tumour [1–4]. The peritumoral stroma is composed largely of activated fibroblasts, inflammatory cells and vasculature and engages in a complex crosstalk with the developing tumour. This interplay appears to be mediated largely by soluble paracrine factors [1–17]. Modifications to the peritumoral stroma include alterations in the secretion of extracellular matrix proteins and growth factors by fibroblasts. Particularly important are the stromally expressed matrix metalloproteinases (MMPs), which may have wide-ranging effects on tumor growth, angiogenesis and metastasis . A number of other soluble fibroblast-derived factors have been shown to induce carcinoma initiation and progression with Wnt-1, HGF and TGF-β playing particularly prominent roles . Gene expression profiling of both stroma and tumor in an inducible human neoplasia model showed that during tumour growth epidermal tissue first showed increased expression of genes mediating cellular biosynthesis followed by increased expression of genes promoting proliferation and lastly increased expression of genes involved in extracellular matrix remodelling and increased cell motility. In contrast, gene expression by stromal fibroblasts shows a different pattern with early increased expression of genes involved in angiogenesis . In addition to the paracrine factors secreted by fibroblasts, inflammatory cells in the peritumoral stroma also secrete growth factors, as well as reactive oxygen species which may further effect cancer growth . Likewise, complex interactions involving activated fibroblasts and tumor-associated macrophages promote angiogenesis . As a model for the interaction between epithelial tumor cells and stroma, basal cell carcinomas (BCC) offer a number of unique opportunities to study these processes. In addition to being the most common malignant tumor, at least in Caucasians , BCC are accompanied by a well-defined peritumoral stroma. The contribution of this peri-tumoral stroma to the growth of BCCs is particularly interesting as several studies have found that the growth of BCCs is stroma-dependent and limited by host immune response. For example, human to mouse mice BCC transplants are only successful in T, B, and NK cell deficient mice [21–23]. Moreover, the variety of morphological patterns of this tumor provides an opportunity to study associations between stromal variation and tumor architecture. Previous work on BCC peritumoral stroma has defined some qualitative features of this tissue. Work by Humphreys et al. has shown an increased number of mast cells and dermal dendrocytes expressing CD34 and GP1b adjacent to BCC tumor nests, although no differences were noted among tumor subtypes . In contrast, among the three most common histological patterns of BCC growth (nodular, infiltrative and superficial) striking differences in the expression of CD44 glycoprotein expression molecules have been observed, with infiltrative tumors showing the greatest expression of CD44 isoforms as revealed by immunohistochemical staining . Dingemans et al. suggest that this finding indicates that CD44 may play an important role in BCC biology and specifically in determining the histological growth pattern and degree of tumor invasiveness. This same study reported that α-smooth muscle actin positivity (as a marker of myofibroblastic differentiation) tended to be greatest in infiltrative tumor areas . Thus there appear to be qualitative differences in BCC peritumoral stroma which are associated with variations in histological growth pattern. In addition to biochemical factors, some morphometric characteristics of BCCs have been explored. Studies performed by Dixon et al. and Jacobs et al. have investigated the relationship between tumour nest morphology and tumour aggressiveness. Significant relationships were found between non-circular nests, smaller degrees of peripheral palisading, and tumour aggressiveness. Dixon et al. and Jacobs et al. also found that fibrous stroma was associated with less aggressive tumours, and that hyalinization was present in the stromas of more aggressive tumours. A couple of studies have also explored the relationship between nuclear cell morphometry and tumour aggressiveness [28, 29]. De Rosa et al. claimed that higher nuclear areas and perimeters were associated with increased aggressiveness; however Appel et al. failed to replicate this finding . Of particular note, de Rosa et al. also observed an increased incidence of hyalinization in the stroma of the aggressive tumours . Considering that previous studies focused primarily on the tumour nests, further investigation into the relationships between the peritumoral stroma and tumour morphometry may be of interest. The purpose of this study is to employ advanced image analysis techniques to look for patterns in the quantitative relationship between different BCC histology patterns and the BCC peritumoral stroma. Cases were selected from the routine clinical caseload of the senior author. Images of 98 hematoxylin and eosin stained slides were digitized using a commercial Aperio CS-O slide scanner at 80 × magnification, and sections containing BCC were stored as JPEG images (1072 × 902 pixels). To avoid possible confounding effects of biopsy site changes and wound healing on the morphological assessment of tumour subtype [30, 31], we excluded any cases that were previously biopsied. We did not include any cases with prior biopsies. Do to a lack of recognized classification schemes for basal cell carcinoma stroma, we did not attempt to sub-classify stroma types. The study protocol was reviewed by the Calgary Laboratory Services Research Committee and deemed to represent a method development project not requiring further ethics approval (CLS Study Code RS-11-504). Printed copies of each of the 98 BCC images were initially evaluated manually. In each BCC image five neoplastic regions of interest (ROI) were identified, and their stromal diameters and tumour radii were delineated. ROIs were selected based on the following criteria: (i) the area must be free of technical artefacts such as variations in staining and cutting of slides and must not include borders of the tissue sample or image, and (ii) ROIs must include only one subtype of tumor (i.e. not transitional or combined tumours). When possible each ROI was selected from a separate tumour nest. Multiple ROIs were identified in the same tumour nest only when the total number of tumour nests was fewer than five. The tumour radii and stroma diameters were measured directly from the printed image for each ROI. A limitation to this approach arose where tumour nests were close together and the intervening space was entirely composed of peri-tumoural stroma. In this instance stroma attributable to each nest was arbitrarily defined as the stroma between them divided by two. Finally, the presence of inflammation or elastosis was noted, and the tumour subtype for each slide was categorized as nodular, superficial, or infiltrative. A circularity measurement of 1 indicates a perfect circle, while more elongated shapes result in lower values . In order to avoid artificially low circularity measurements, tumour nests cut off extensively by the image edge were excluded from this analysis. Images were classified into tumor subtypes according to the definitions provided by Crowson . The 98 images were composed of 23 superficial BCCs, 60 nodular BCCs and 15 infiltrative BCCs. The presence of both solar elastosis and an accompanying chronic immune response were subjectively scored with absent and mild counted as negative and moderate and marked counted as present. Data analyses were performed using IBM SPSS Statistics v19. Box plots of the morphometric statistics and bar plots of the categorical statistics were created using R v2.13.0. Non-parametric tests were employed, as initial calculations indicated non-normal distributions. An analysis of variance was performed using the Kruskal-Wallis test, and Mann-Whitney tests were employed when significant differences between the groups were found. Categorical variables were analysed using the Chi-squared test. Interaction effects between continuous and categorical variables were tested using binary logistic regression. Examples of the different basal cell carcinoma subtypes included in this study are illustrated in Figure 1. Statistically significant differences were found among tumor subtypes with regard to median tumour radii (p = 0.005), stroma diameters (p = 0.008), and tumour to stroma ratio (p = 0.000006). Post hoc pairwise comparisons showed different median tumour radii (p = 0.0009) and stroma diameters (p = 0.003) between the infiltrative and nodular subtypes. For each of the tumour subtypes different tumour-to-stroma ratios were obtained (infiltrative-nodular p = 0.00006, infiltrative-superficial p = 0.006, nodular-superficial p = 0.005). There was insufficient statistical evidence to conclude that circularity varied by tumour subtype (p-value = 0.3). The morphometric comparisons are summarized in Figure 1 and Table 1. Examples of basal cell carcinoma subtypes included in this study: (a) nodular, (b) superficial, (c) infiltrative. Box and whisker plots for the mean tumour radii (A), stroma diameters (B), tumour to stroma ratios (C), and circularities by tumour subtype (D). The presence of elastosis was correlated with the tumour subtype (p = 0.033), as eight of the fifteen (53%) infiltrative, twelve of the sixty (20%) nodular, and six of the twenty-three (26%) superficial tumours contained elastosis. The presence of an immune reaction was not found to be significant (p = 0.1). The categorical statistics are summarized in Table 2. Possible interaction effects between dermal elastosis (significant in univariate analysis) and the continuous variables were explored using binary logistic regression. No statistically significant associations were found using this approach (analysis not shown). Presence of immune reactions or elastosis in basal cell carcinomas. 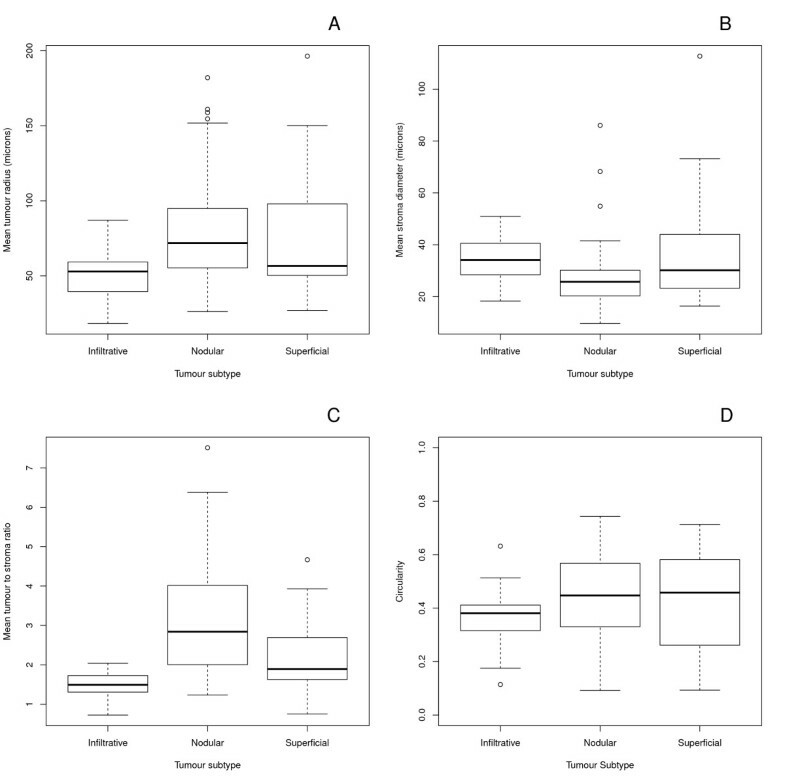 This study quantified the morphometric relationships between basal cell carcinoma subtypes and their peritumoral stroma. Manual and computer-assisted methods were employed to quantify size and shape statistics for infiltrative, nodular, and superficial BCC subtypes. The presence of inflammation and elastosis was also noted for each subtype. Significant differences were found between the median tumour radii and stroma diameters of the infiltrative and nodular subtypes. The infiltrative subtype was associated with thicker stroma, but smaller tumour radii, with a correspondingly smaller tumour-to- stroma ratio. Therefore the biochemical differences previously described for infiltrative versus other BCC subtypes may be accompanied by quantitative changes in the peri-tumoral stroma. Another noteworthy finding was that elastosis was present in a significantly higher proportion of the infiltrative subtype images. One possible explanation for this finding is that the presence of extensive sun damage contributes to the phenotype of BCC, predisposing to an infiltrative growth pattern. Possible mechanisms for such a relationship are speculative but may include differences in diffusion characteristics or paracrine factor expression in sun damaged skin. Similar arguments could be made for the presence of a chronic immune infiltrate associated with infiltrative BCC: lymphocytes could be recruited in response to some characteristic of the tumor or they may themselves secrete factors that influence the BCC phenotype. Unexpectedly, the circularity of the tumour nest was not found to influence the tumour subtype. This may have resulted from the presence of nodular tumour nests within some of the infiltrating subtype slides, resulting in higher mean and more variable circularity measurements. Alternatively, variance of the circularity measurements among tumor nests on the same slide may provide a means of distinguishing the tumour subtypes based on their shape. Moreover, the use of different shape metrics may provide a superior means of distinguishing tumour subtypes based on their morphology. These questions could be explored in future studies. This study was unique in several ways. First of all, a greater emphasis was placed on the relationship of the tumour morphometry and its stroma. Previous studies have focused largely on the tumour itself, therefore ignoring an important factor in tumour growth. Another benefit was that the shape statistics were quantified using an open-source digital imaging and analysis program. This facilitates replication, as ImageJ is freely available and is capable of providing circularity measurements with the default package. A further benefit of using software to quantify the tumour nest shape is that it eliminates the subjectivity resulting from categorizing the tumour shape qualitatively. Further research could improve upon this study in a couple of ways. One limitation was that rarer BCC subtypes were not included. Also, as mentioned earlier, inherent in an observational study is the fact that it was not possible to determine whether stromal differences influenced the tumour architecture or if they resulted from the architecture itself. Another limitation of this study concerns the applicability of our findings to other malignancies. Basal cell carcinomas differ from many other malignancies in that they exhibit limited metastatic potential and often lack features common to other malignancies such as aneuploidy . Previous studies that have quantified the morphometry of BCC have focused on the relationship of the tumour's characteristics and its aggressiveness. Furthermore, these studies have focused mainly on the tumour, rather than its relationship to its stroma. As a result, it is not possible to directly compare the findings presented here with those of the previous BCC morphometry studies. That aside, previous authors have found that aggressive tumours have different morphometric characteristics than non-aggressive ones. This may be related to the different morphology found between the different subtypes in this study. The results obtained are also consistent with the presence of biochemical differences that were previously reported. As discussed, Humphreys et al. found that the expression of CD44 glycoprotein differed amongst the infiltrative, nodular, and superficial subtypes, with infiltrative tumours showing the highest expression. The expression of CD44 may have contributed to the greater stroma diameters and lower tumour radii measured for the infiltrative subtypes in our study. Humphreys et al. also reported greater α-smooth muscle actin positivity in the infiltrative tumours, and Papanikolaou  demonstrated integrin-linked kinase (ILK) overexpression in infiltrative tumours, which may also have contributed to the morphological differences. In this study we demonstrated that there are quantitative differences in the peritumoral stroma among BCC subtypes. Future work should focus on integrating these morphometric differences with the previously described biochemical differences in stromal microenvironments among BCC subtypes. Kyle Lesack and Christopher Naugler contributed equally to this work. KL was supported by an O'Brien summer studentship from the University of Calgary and a research grant to CN from the University of Calgary. CN devised the original study design. KL obtained the morphometric measurements. Both authors participated in drafting the manuscript. Both authors have read and approved the final manuscript.